AW Blair & Sons traces an unbroken record of service to the communities of Stevenston, Saltcoats and Ardrossan, back to the mid-1950’s. The premises of AW Blair & Sons offer clients a complete funeral service, including the use of a well-appointed service room, or parlour, private rooms for the making of funeral arrangements or viewing of the deceased, with ample parking for the exclusive use of mourners attending funeral services. All vehicles used for the conduct of funerals are garaged on-site. The service room is equipped with an induction loop as part of a sound system, which is designed to allow hearing-aid users the ability to switch to the “T” setting. A ducted ventilation system has recently been installed. Alexander Wallace Blair, having completed his apprenticeship pre-war, returns to Douglas Peebles & Son, Joiners and Funeral Directors of Saltcoats, after his war service with the Royal Engineers. He later sets up his own joinery business in Stevenston. Alexander Wallace Blair begins to carry out funerals as well as running his joinery business. Alexander Wallace Blair gains Diploma in Funeral Directing after a course of study and passing the exam as set by the National Association of Funeral Directors. Ian Blair, after a course of study and passing exams in both theory and practice, is admitted to membership of the British Institute of Embalmers. This qualification has proved to be an invaluable specialisation for the full time professional funeral director. 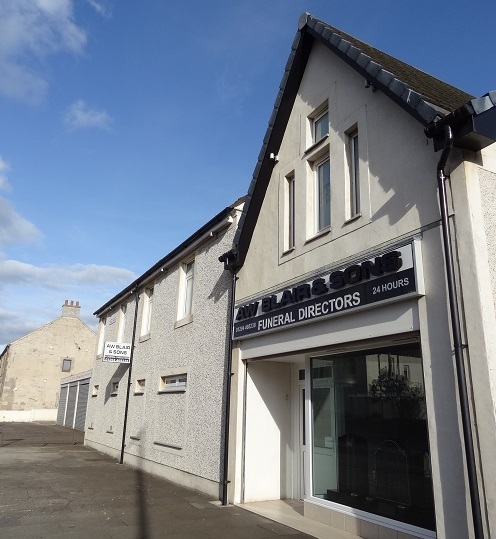 The firm acquires new premises at Seabank Street, Saltcoats. With the opening of the premises at Seabank Street the undertaking arm of AW Blair & Sons becomes a separate entity dedicated solely to funeral directing within the three towns and beyond. The firm adopts Golden Charter Funeral Plans as its preferred scheme and wholehearted endorsment of this product is offered, due in no small part its inception here in Scotland. Having been agents for Monumental Sculptors since 1991, AW Blair & Sons acquire the premises at 81 Canal Street. The building is completely re-modelled to become the memorial showroom. AW Blair & Sons celebrates the 25th anniversary of the opening of the funeral parlour at Seabank Street, Saltcoats.